Signs of spring are steadily popping up in central Kentucky. Robins are hopping around, pecking for worms. As I walked around the farm, I looked down and saw green shoots everywhere. The wild onions that Danthebluegrassman loves are about 6 inches tall. Horse slobber has turned grass green, not hay brown. Mud is slick and gooey and ever-present. And best of all, as I ran my hand down Gulch’s neck today, I came away with a palm full of winter coat! My sister-in-law’s nephew’s second grade class is doing a project based on the children’s book “Flat Stanley.” The idea is for each child’s paper alter ego to be passed from person to person and eventually back home, providing a kind of virtual geography lesson. “Flat Nathan” arrived in Kentucky late last week, and today he visited Old Friends. The people on my afternoon tour kindly helped introduce Flat Nathan to some horses. Gulch thought Nathan was mildly interesting. The Wicked North and Bull in the Heather posed beautifully. Little Silver Charm just wanted to know if Flat Nathan was edible! From here Flat Nathan will head out to another location, and another adventure. We have a new tour guide learning the ropes, so Marlene walked along on our tour this afternoon. I think she has gone out with a couple of other tour guides and today she got the Sunday version, or as I call it, tour lite. For better or worse, Sunday tours are mostly heavy on the carrots and slobber part of things! With temperatures near 60 and the rain and thunder holding off until later in the afternoon, it was an enjoyable day to be outside. This morning as I walked around the farm, nearly every horse in view was down for a nap. Gramps (whose actual 30th birthday was this week) was down for a snooze, as were Free Spirits Joy, Delay of Game, Kiri’s Clown, Swan’s Way and Patton. The only standing horse I could see from the office was Sunshine, and even he was clearly napping. Patton had made himself a comfy bed right in the middle of his hay pile, complete with pillow. Delay of Game was in his favorite position at the high point of his paddock, watching the happenings as he lay curled up like a big dog. Many of the aches and pains we saw over the latter part of the winter from the frozen, rutty ground have healed up. Bluesthestandard is still stall-bound but doing much better. Commentator is back to his normal self. Glitterman’s arthritis is about as good as it gets. Falcon Scott is in Cherono’s paddock while Cherry gets limited turn-out after he pulled something in his back leg. But even he was trotting around perfectly sound today. A couple people have asked me for updates on Stormy Passage, and I’ll continue to keep everyone up-to-date. Stormy is doing fine—still no visitors, but he is shiny and happy in his stall. I think he’s put on a couple pounds, to tell you the truth. I heard he is headed off for some tendon treatment at the vet clinic this week. Today I saw several cards and donations that came in over the past couple weeks for Stormy, so thank you for that. I can’t wait until he is a tour horse—he is going to LOVE it! And speaking of horses that love their new job? Let me tell you, that Patton must think he has died and gone to heaven! He comes over to greet every visitor with pricked ears. He is gentle, kind and very handsome. You know, I have always thought that Old Friends must be great fun for old racehorses—all the attention they love and remember from their athletic heyday, without actually having to DO anything! I was pretty excited to see so many little hints of spring today. As I write this, we are in the midst of an early spring thunderstorm—a few booms, some lightning and a nice downpour. Next up for central Kentucky are the redbuds, my very favorite sign of spring. (Well, redbuds and baby horses in the fields and of course, Keeneland!) We hope you can visit us soon, but in the meantime thanks for spending this Sunday with Old Friends. This is the story of a horse. While some of the blanks admittedly are filled in with assumptions, the story is true. And although a different perspective would likely make the facts appear in a different light, the journey and its end remain the same. The horse’s name is Stormy Passage. The dictionary defines passage as “an act or instance of passing from one place, condition, etc., to another; transit.” As you will see, it an apt name, as this horse’s life is a metaphor for a passage from one place and condition to another. And as his name would imply, it hasn’t always been smooth sailing. Stormy was born in 2005, a dark bay or brown horse by Richter Scale out of a Northern Dancer-line mare named Northern Dynasty. He was born in Kentucky, at a farm in the Lexington area and was entered in the 2006 Keeneland September Yearling sale, where he did not meet his reserve. His breeder perhaps saw some potential in the young horse, because he kept and raced him. Stormy won his first two races in 2008, as a three year old. All in all, Stormy raced a couple handful of times in cheap races for different owners. He finished in the money 60% of the time and judging by a couple of longer layoffs, injuring himself on and off during the years he raced. All but two of his 11 starts were at northern Kentucky’s Turfway Park. This is the part of the story where the winds of change begin to blow Stormy around. In 2010, after a layoff and with a new owner, Stormy returned to the races. This isn’t all that unusual. It’s possible-even likely perhaps-the intent was to give Stormy time to rehab, see if he could successfully return to the races and if not, retire him. In any case, after a layoff of nine months Stormy returned to Ellis Park in the first of his final four races, a $4000 claiming race. He ran third. Stormy’s last three starts were spaced about two weeks apart in December 2010 and January 2011. In his final start on January 30, he was unsaddled near the 7/8ths pole and vanned off. So after a couple different owners, a sesamoid fracture, and some wear and tear Stormy found himself running in that final claiming race at Turfway Park, where he was pulled up with a bowed tendon. With this latest injury it was clear he didn’t have a future as a racehorse. In what I sincerely hope was a difficult choice, it was decided to euthanize Stormy Passage. This story, like that of so many other low-level racehorses, could have ended right there. But the winds of change weren’t done with Stormy yet. The veterinarian summoned to euthanize Stormy refused to do so. Other vets offered opinions, help, care. Turfway Park became involved, and Stormy lived in a Turfway stall for two weeks while calls were made. Homes are scarce for any ex-racehorse, but especially so for the broken down ones needing specific, long-term care. Several options were discussed, explored, and ultimately discarded for one reason or another. And so, on February 10, 2011, the Turfway Park horse ambulance pulled up to Old Friends. Inside, wearing a warm blanket and supportive leg wraps, was Stormy Passage. I met Stormy for the first time today. He is a friendly, medium-sized bay horse, with white feet and a narrow white stripe down his nose. He is in a stall in the big barn, wearing a cast on one front leg and a thick leg wrap for support on the other. Dr. Fraley has already worked on his feet, and in a few days Stormy will get a special shoe to help support his bowed tendon while it heals. Stormy will spend several months in his new stall recovering, eventually being able to go outside to just be a horse. For now, because he needs quiet and calm, he will not be a stop on our tours. For every famous horse at Old Friends–horses like Gulch or Commentator, Kudos or The Wicked North–who never received anything but the best of care, there are any number of horses like Stormy Passage. People come to see the famous horses. But I promise the ones they remember are the horses like Stormy. No rescue or retirement facility can save every horse. But Stormy Passage is an example of what happens when one person stands up, and then another person stands alongside, and more people become involved in helping this one horse, this one time. It doesn’t matter what you can do–donate, volunteer, provide a home. One dollar, one horse, one time, one broken piece of our world fixed. Spread the word. With Punxsutawney Phil venturing out of his den this past week, we all are hoping for his predicted early spring. C’mon Phil, we know you can do it! In the meantime, today was still a pretty nice day in central Kentucky. It started out a little on the cold side, with a chilly wind and some clouds. But as the morning went on, the skies cleared up and the breeze settled down some, making for a nice day to walk around the farm. We had some special visitors at the farm today. Matt Wooley, his wife Wendy, and Alex Brown visited us. I have met Matt and Wendy before but had never met Alex, so it was a thrill for me. For those of you who don’t know these folks, Matt is EquiSport Photos; he takes many of the Old Friends photos you see. His website, http://www.equisportphotos.com/ is well worth a visit. Matt does beautiful work. Alex Brown is a horseman and the founder of http://www.alexbrownracing.com/. He is among the leading proponents of ending horse slaughter, finding homes for ex-racehorses, and developing a cure for laminitis (the painful hoof disease that is all too frequently fatal to horses.) And now, Alex can add book author to his resume. His new book, Greatness and Goodness: Barbaro and his Legacy will be available in another month or so. (http://www.facebook.com/pages/Greatness-and-Goodness-Barbaro-and-his-Legacy/206898058928) Barbaro, of course, won the 2006 Kentucky Derby but was injured two weeks later in the Preakness. After many months of intense care, Barbaro lost his fight due to complications of laminitis. Alex kindly shared the publisher’s proof of his book with us today, and I spent some time checking it out. It’s a beautiful book, with evocative artwork and beautiful photographs. My impression is that Alex did a great job of providing context to the life, and death, of Barbaro. He covers Barbaro’s birth, his racing career, his injury and treatment. But he also spends large parts of the book revealing how Barbaro became the catalyst for so many good things. Topics such as racehorse rescue, anti-slaughter, second careers for Thoroughbreds, and retirement or sanctuary farms have all been hugely impacted by Barbaro’s legacy. Alex did a wonderful job showing how all this came together in his book. 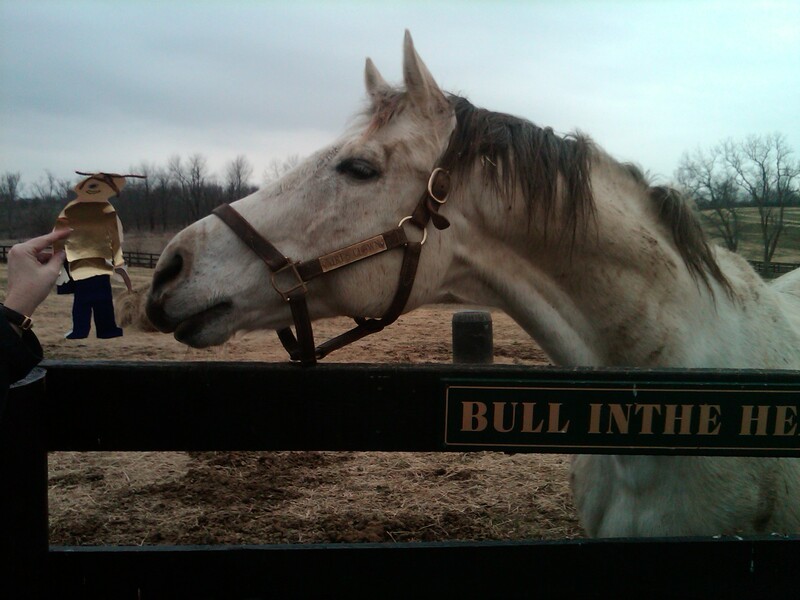 Back to the horses…I drove up to the annex today and Wallenda met me at the fence. He was the only horse who cared though, as everyone else was either napping or picking through the dead brown grass for some microscopic growth worth eating. Wallenda munched a couple mints, slobbered on my jacket and let me kiss his nose. Then he wandered off to watch the cows in the field next door. In fact, there was a lot of napping and grass picking today. Dinard and Marshall Rooster were both laying down for their naps, side by side, bay and gray. The most noticeable thing about the horses today was the mud. They were covered, caked, and clogged. The Wicked North had mud from his nose to the very tip of his left ear, covering his white face and matted into his forelock. He looked so pleased with himself! Sunshine was covered, as was Marquetry. I tried to scratch Kiri’s back but he was so sticky with mud it didn’t matter. Of course, it didn’t stop him from rubbing his dirty face on my arm, but then what else is new? And do you know who was relatively clean? Swan’s Way may have had knots in his mane and hay in his forelock, but he had little mud on his body. Ogygian and Creator were also pretty clean. Although at this time of year, clean is more a state of mind. Because while they may have looked clean, I know there is plenty of dirt hidden in those thick winter coats! By the way, for those of you have asked, we are working on scheduling our First Ever Blog Event at Old Friends. Michael and I talked briefly today about ways to make it special, and I am thinking about holding it in May sometime. Let me know what you think–I need your input!